Although this meme isn't actually new, I just came across it and can't wait to participate! Since this Friday is New Year's Day, I will be waiting until the following week. I thought I'd mention it earlier, though, in case any of you are interested in joining up. 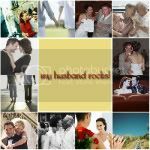 If you'd like to join me in ~"my husband rocks" Fridays~ every Friday, write a post proclaiming to the world why your husband (or wife, or husband-to-be, or wife-to-be) ROCKS!, then come back here and comment with the permalink to your post! Click on the logo above for more details.